I’ll be selling and signing my book Saturday at the Claremont gift store Heirloom, 175 N. Indian Hill Blvd. (corner of Second) from 6 to 8 p.m. during the monthly Art Walk. Even if you have my book already, drop by: The store has lots of neat items, many of them handmade, including coasters and refrigerator magnets with designs from orange crate labels. Saturday’s inaugural Pomona Reads! festival was well-attended, with adults, children and families strolling the vendor booths, listening to music, making crafts and listening to authors. 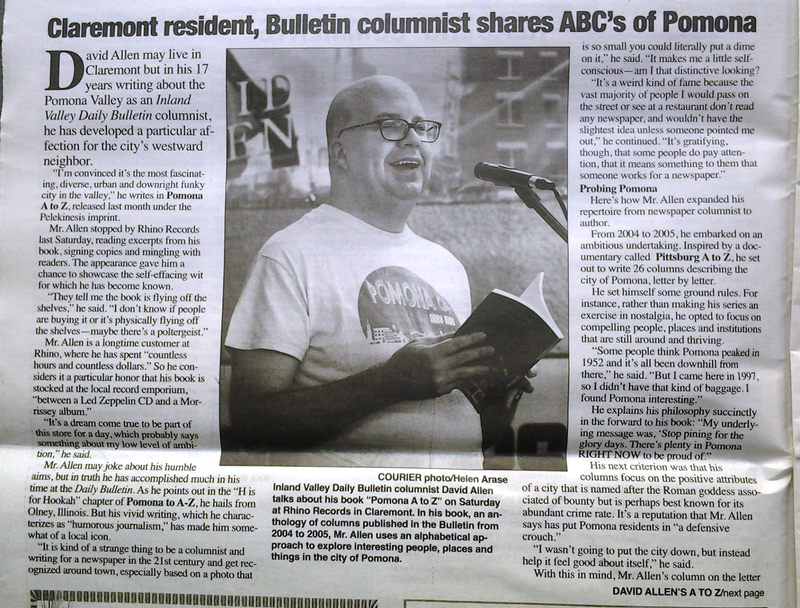 Above, I’m signing a copy of “Pomona A to Z” for two readers while another waits to buy one. This was about as close to a rush as it got, but I sold almost a dozen copies, and also moderated a panel on Pomona history. Photo contributed by Pomona’s Ren. I don’t know why it didn’t occur to me last year to do this, but a few weeks ago, leaving a Food Truck Thursday night at Fairplex and thinking about the concerts in the park nearby, the idea came to me. Linda Taylor, the band’s conductor, agreed. It could very well be that everyone at the concert will have my book already, there being a lot of overlap between their crowd and my crowd — but my guess is there’ll be some who’ll have no idea a book about Pomona exists. And that’s where I come in. The concerts are a community staple and, as I’ve written before, a kind of small-scale Hollywood Bowl experience, as listeners fan out on the grass on blankets or lawn chairs in front of the bandshell at Ganesha Park (1575 N. White Ave.) to watch the band perform under the stars. The music might be a little corny or old-fashioned for your tastes, and I’ll admit I’m more of a Glass House guy myself, but there’s no denying the charm or community feeling here. The show starts at 8 p.m. and I’ll try to get there around 7. Come say hello, even if you have my book. If you don’t, bring $20. 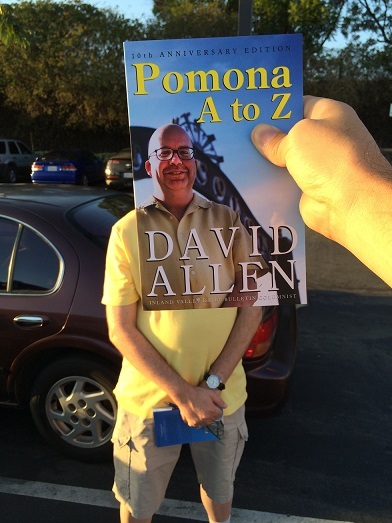 July 18 marks the one-year anniversary of publication of my first book, “Pomona A to Z.” Gosh! It’s done quite well, selling more than 500 copies to date. And although events and sales have tapered off, it’s still selling. Barbara Cheatley’s in Claremont just began stocking it in June; when I dropped off copies, three customers bought it before I could even leave the store. I sold two just this week to a Pomona couple, one for them and one for a friend who’s moving away. If you’ve bought a copy, especially if you bought one directly from me at a signing or talk, thank you! It’s been gratifying to meet people and take their money. That’s said jocularly, but it’s sincerely true too: To have people like my work enough to show up to an event to meet me, and to pay me for my book (as opposed to simply reading me as part of the newspaper), has been a real boost. The extra income is modest, but for a fella working in newspapers in the 21st century, and under a recessionary wage freeze, it’s been useful, believe me. Where can you buy a copy if you don’t have one, or want another? • in Pomona, Magic Door Books (155 W. Second St.), the DPOA office (119 W. Second St.), the Glass House Record Shop (248 W. Second St.), the dA Center for the Arts (252 S. Main St.), Funny Business Comics (896 N. Garey Ave.) and the Ebell Museum of History (585 E. Holt Ave.). I’ll update this list if new venues are added. As for a second book — a collection of columns is in the works for 2017. 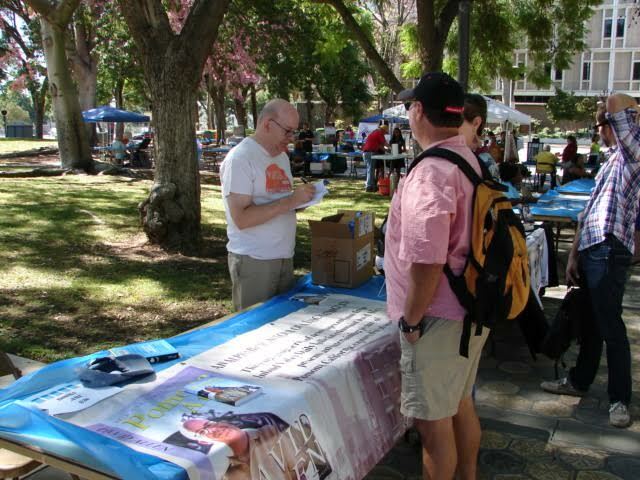 For Village Venture, the popular crafts fair and street festival that took place Saturday in Claremont, I arranged to sell “Pomona A to Z” in the parking lot of Rhino Records, right by the sidewalk to catch foot traffic. As promised in print, I showed up at 11 a.m. It got off to a good start when a woman with a walker approached to say she’d been waiting since 9. (She had left and come back, thankfully.) “I couldn’t remember when you said you’d be here,” she admitted. Over the next hour, I sold four books. Might have been more if I were the type to shout toward passersby, “Pomona in 26 letters! 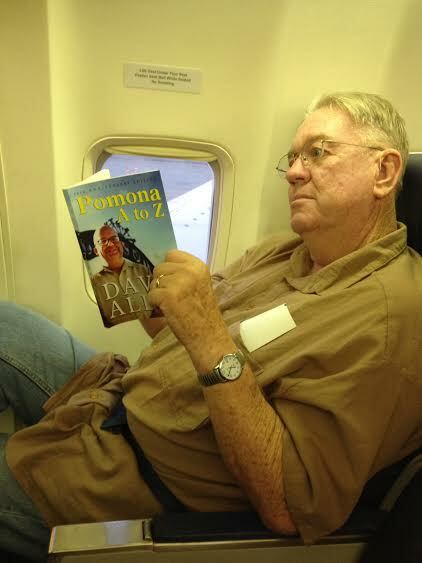 Get-cher copies of ‘Pomona A to Z’ right cheer! 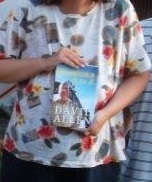 Meet the author!” Instead, I sat quietly and read an H.P. Lovecraft book. Another walked up with a friend in tow. “I love you to death,” the woman said. She talked about how she enjoys my column and how much better she likes the Bulletin than the San Gabriel Valley Tribune, because as a Pomona resident, the Bulletin has more news of interest to her. I gestured toward my book and said leadingly, “Pomona…?” “I’m short on cash,” she said (without asking how much it was) and quickly left. That’s okay. My book’s target demographic is people who only tolerate me. I can’t complain about selling five: I left with $100 in my pocket, pretty good for an hour’s work. And it was nice to meet everyone. Even the odd encounters were entertaining. I was surprised when the Courier put my April 9 talk at Rhino Records in its calendar of events — in which I was described for the first time in my life as “reporter and author” — because, after all, we are competitors. 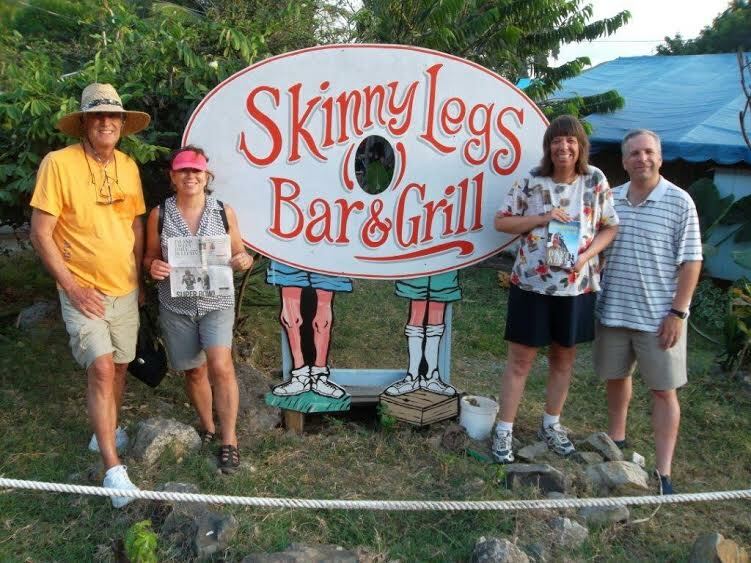 It’s a friendly rivalry, though, and the Courier is mentioned in my column now and then. Also, I’m a subscriber and live in town. I was even more surprised when a reporter and photographer from the paper showed up to my talk. You mean I’m getting actual coverage? I was. 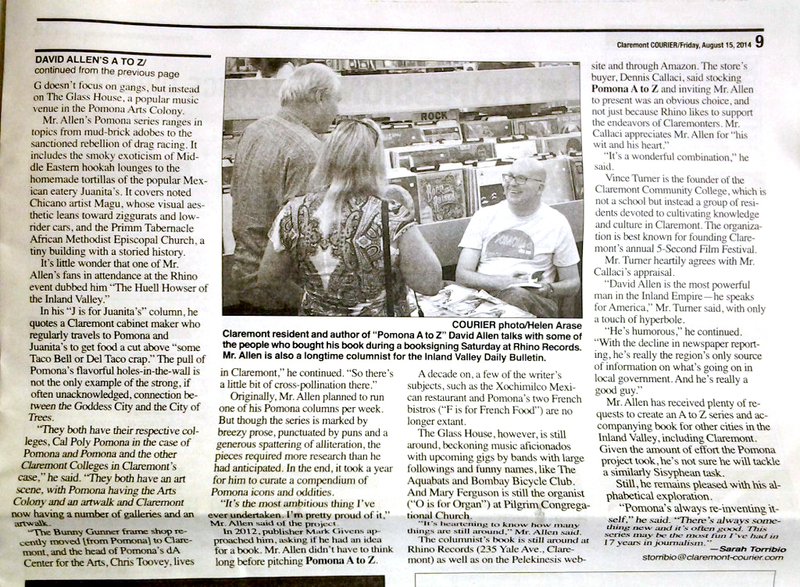 The reporter later interviewed me by phone and the whole thing turned into a two-page spread, with two photos, in the Courier’s Friday issue. Gosh! Well, I couldn’t have asked for a better presentation, and even a journalist friend of many years said she wasn’t sure she could have written a better story about me. So, my gratitude to reporter Sarah Torribio and photo intern Helen Arase. I got a kick out of the whole experience, including seeing a couple of my cracks during my talk making print, and being “Mr. Allen,” in the Courier’s New York Times-style of respectful address. The Courier wisely doesn’t give away its product for free online, so I can’t link to the story, but I photographed the two pages; click on the photos for a readable view. The issue is on sale at news racks through Thursday. * Update: Turns out the story can be found online here. 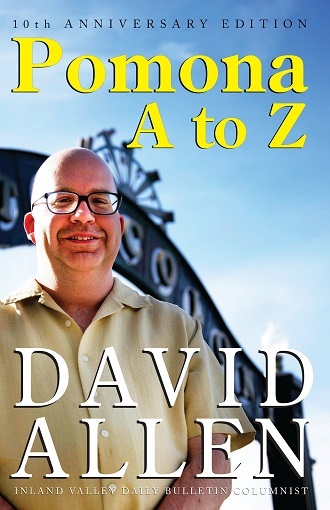 I’m doing not one but two book signings Saturday for “Pomona A to Z.” The first is at Claremont’s Rhino Records, 235 Yale Ave., from 1 to 3 p.m. The second is at Pomona’s Magic Door Books, 155 W. 2nd St., from 7 to 9 p.m.
Evidently I’m the starting author at both places. Let’s see Clayton Kershaw try that. The Magic Door signing is sure to be low-key, given the intimate size of the store, and you get the benefit of the Second Saturday Art Walk (but the downside of searching for parking). I’m not sure what I’ll be doing at Rhino: Will I talk a little and read a chapter? Or will I just sign? I definitely won’t sing. I’m anxious about the Rhino thing and am doing my best not to think about it. After all, they have a small stage where Berlin, Dengue Fever and other bands have performed, which is probably where I’ll be, and the idea of standing there talking into a microphone, and gazing out over the aisles — as some continue their shopping and wonder why this man is talking at a record store — is kind of intimidating! And yet, what other chance will I ever have to do it? In related news, after falling from No. 10 to No. 23, “A to Z” is back at No. 12 on the Rhino sales charts for the week, behind Judas Priest and Jack White but ahead of the Black Keys and Weird Al Yankovic. Not bad for a book — the only book in the Top 25.